Follow the most up-to-date rules to maximize safety when working with dangerous substances! 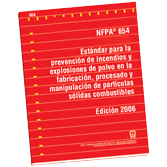 The 2006 Spanish edition of NFPA 654 provides requirements for safety to life and property from fire and explosion associated with the manufacturing, processing, blending, pneumatic conveying, repackaging and handling of combustible particulate solids or hybrid mixtures. Revised the definition of combustible dust, deflagration, and hybrid mixture. Revised and expanded provisions applicable to intermediate bulk containers (IBCs) to bring the requirements up to the current state-of-the-art in IBC technology. Annex material provides expanded guidance on the application of area electrical classification for various dust accumulation levels and safeguards. Performance-based requirements (revised Chapter 4 and new Chapter 5) provide flexibility in applying the Standard.